The inaugural meeting of the PLC in Detroit last year was a breakout moment for the Placemaking movement. The second meeting built on the success in Detroit and advanced the movement’s agendas based on the progress and challenges identified since then. The theme of the Pittsburgh meeting was “Placemaking: Building a Campaign.” Experts, public officials, and activists from around the world convened for a day and a half to determine the best approaches to scale up Placemaking as a strategy for community change, and to build a broad coalition around this new international social cause. 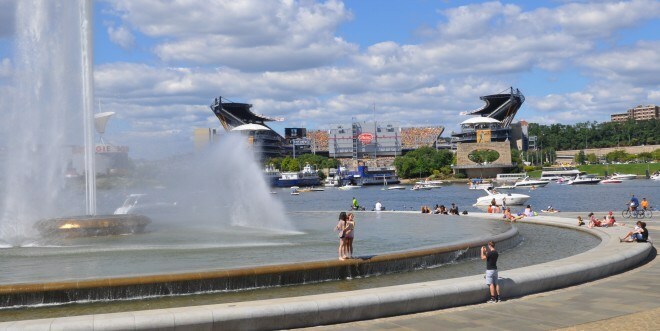 Our goal in Pittsburgh was to create a comprehensive framework for a Placemaking campaign—to identify key actions that can increase awareness, improve understanding, and help us to accomplish our mutual objectives. The PLC meeting took place in partnership with Pro Walk/Pro Bike/Pro Place 2014, North America’s premier active transportation and livable communities conference. This partnership provided PLC members exciting opportunities to make new connections and learn about campaign building from the leaders of the pedestrian and bicycling advocacy communities. As outlined in the report, there were healthy debates on where we should go next, but a clear consensus emerged that we’re ready to take action now. As we’ve been saying for some time, Pittsburgh is a hot city right now because of its focus on building strong place-led communities as the heart of the City’s development strategy. Formerly a rust belt capital, Steel City has been reborn, and is now recognized as one of the most livable cities in the U.S. PLC meeting attendees got to see firsthand what all the buzz is about on a city-wide tour, and reflected about progress and opportunities in the host city in panel discussions and networking events. If you are not already a Placemaking Leadership Council member, please click here to learn more and apply.